Casablanca Records founder Neil Bogart was at the heart of the music movement in the 1970’s. He had a knack for discovering talent that was different from what was out there in the music scene. Among his discoveries were Donna Summer, Parliament and KISS- to name a few. After the dissolution of the label, he started another label named Boardwalk Records. His biggest discovery at the label was the former member of The Runaways Joan Jett. The success of the label would be short lived, as Bogart would succumb to cancer two years after founding Boardwalk. Carrying on tradition- as well as the label’s name- is his son Evan “Kidd” Bogart. A pop songwriter, he wrote songs for the likes of Big Time Rush, Sean Kingston and Britney Spears. His discovery is the Arlington, Pennsylvania singer Zsuzsanna Eva Ward- or simply, ZZ Ward. She released the EP “Criminal” before releasing her major label debut “Til The Casket Drops” in Fall 2012. Her album was produced mostly by former Dr. Dre session musician Theron “Neff-U” Feemster and the production team Blended Babies. Although she’s been compared to British singer Adele, Ward really sounds like a more accessible KT Tunstall. Her album starts off with the title track “Til The Casket Drops”, a song about staying by her lover’s side even during the rough times. On the bluesy first single “Put The Gun Down”, Ward confronts the other woman responsible for taking off with her man. She’s falls helplessly in love on “Blue Eyes Blind”, while loving a man to accept her who she is on “Home”. Rapper Kendrick Lamar guests on the song “Cryin’ Wolf”, where she deals with an inebriated boyfriend who’s out on a drunken stupor. Fitz & The Tantrums lead singer Michael Fitzpatrick produces the radio friendly “Save My Life”, while OneRepublic members Ryan Tedder and Brent Kutzle produce the lament over a failed relationship “Last Love Song”. Former A Tribe Called Quest member Ali Shaheed Muhammad produces the acoustic track about infidelity “Charlie Ain’t Home”, while Indiana rapper Freddie Gibbs guests on the song “Criminal”. 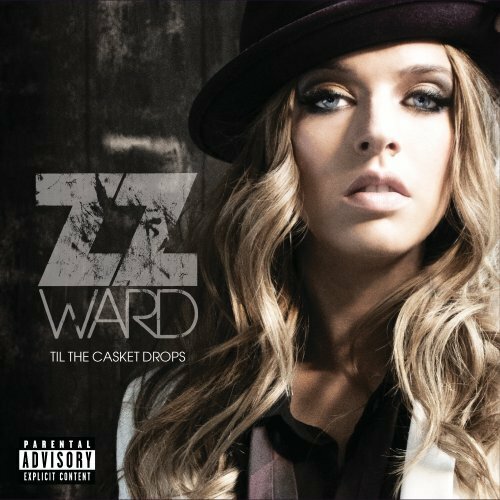 “Til The Casket Drops” is a great pop record from ZZ Ward. Despite her youthful presence, her music is very mature for the music in her field. It’s only a matter of time before she makes her name in the industry.